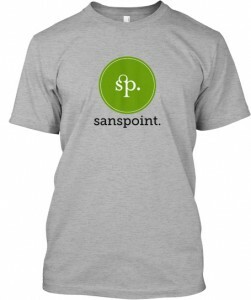 Sanspoint Shirts, Take 2 – Sanspoint. The official Sanspoint is back. Support my long-winded ramblings by purchasing this top quality Sanspoint t-shirt. Only $19 American, and all proceeds go to keeping me in beer and/or whiskey.